You finally took the plunge and decided to pour some money into pay-per-click (PPC) advertising. But now that you’ve made the decision, you’re staring at your screen wondering how on earth to advertise your business as cost-effectively as possible. The good news is you don’t need to hire a full-time advertising employee or an expensive outside firm. 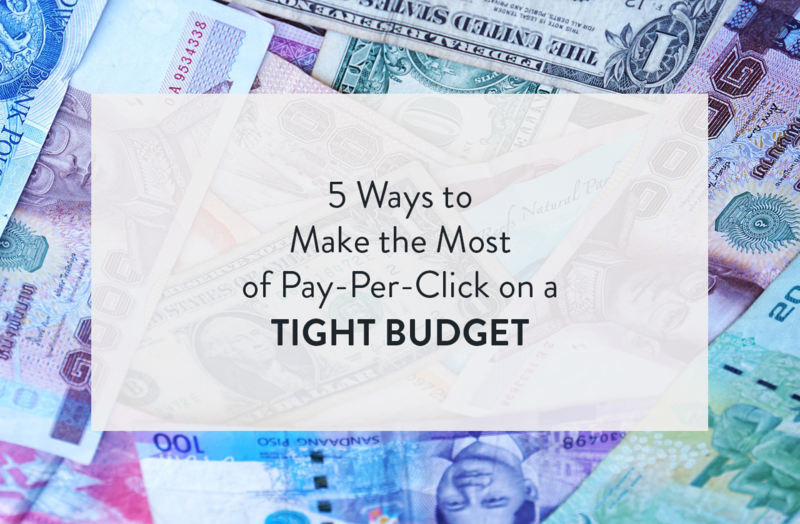 If you’re willing to put the extra time into your PPC strategy, you can certainly make the most of pay-per-click advertising on a small business budget. Companies can choose to place their advertisements on two different networks: the Search Network or the Display Network. The Search Network is what you see when you run a typical Google search. Recall those ads that are displayed at the very top of the screen? Those are advertisements placed in the Search Network. The first two images are ads placed through the Search Network. The Display Network, on the other hand, is found on websites and blogs that have AdSense enabled. 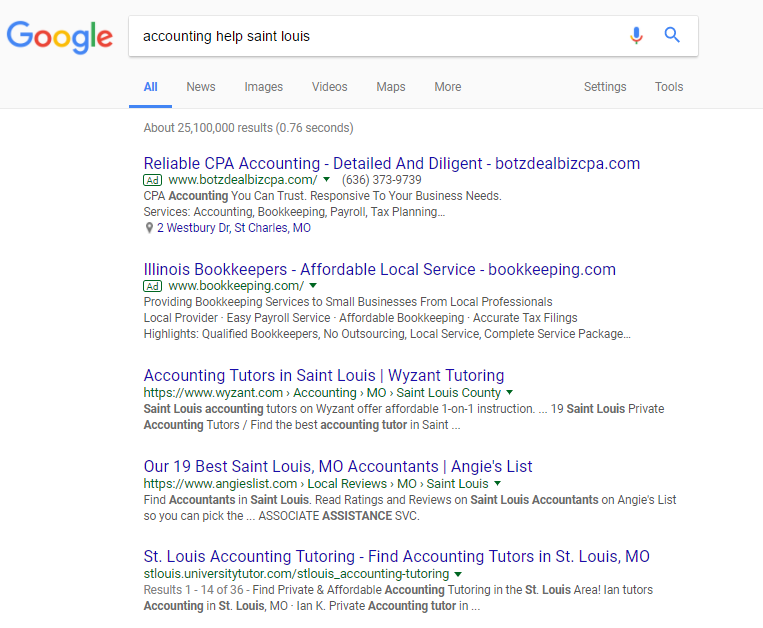 Essentially, if you chose to advertise your accounting firm on the display network, it may show up as a banner on a business blog featuring related topics. The networks fulfill different advertising goals. The Search Network reaches buyers in the late stage of the buyer’s cycle when they are ready to make a purchase. The Display Network targets the awareness stage of the buyer’s cycle. Instead of defaulting to display your ads on both networks (which can drive up costs), create separate campaigns for the two networks. If your budget is really limited, only place your ads on the Search Network. You want good ROI on your advertising investment. This is where you are more likely to convert whereas the Display Network is geared towards brand awareness. Google AdWords lets you focus on a specific geographic area. Now, it may be tempting to reach a wider audience, but if you have a low budget, be strategic with your ad’s reach. Are most of your customer’s local? Do you only ship domestically? If that’s the case, stay close to home. Extending your advertising reach to areas you can’t deliver to is expensive and unlikely to earn real returns. If you’re just starting out with online advertising, you’re probably in one of two places. You’re either feeling overwhelmed by the project or excited by the possibilities. This piece of advice – to focus on your popular products – can help small business owners in either situation. Focusing on your popular products means reaching out to people with something you already know will make the sale. This may sound counterintuitive – why would I spend money promoting a product I have no problem pushing? But it’s not. Your ad’s purpose is to show more people what they’re missing out on. And it reaps a nice ROI. If you spend $2 per click, but one click wins you a customer who spends $200, that’s a pretty fair trade. Focusing on a core product offering lets you go into the AdWords process with something you are very familiar with, keep your budget low, and increase your chances of converting leads. For overwhelmed individuals, it makes the process manageable. For eager beaver amateur advertisers, it prevents them from biting off more than they can chew. Google’s Quality Score measures how healthy your advertisement and associated keywords are. It’s important not only for the quality of your ads, but also for the cost of your ads. This is known as cost-per-click or CPC. Google determines ad rankings by looking at both your highest bid and your Quality Score. This ensures there are helpful results for searchers and not just spam. So even if your competition has a higher bid, you may win the top spot thanks to a higher Quality Score. So how do you earn that top Quality Score? Ad Relevance: How relevant is your ad to what the person is searching for? Your relevance score be improved by closely matching search queries with relevant keywords and creating specific ad groups. Click-Through-Rate (CTR): This measures the number of people who actually click on your ad upon seeing it. CTR can be improved with more compelling or specific copy, and a stronger call to action. Landing Page Experience: How user-friendly is your landing page (the website customers are led to)? Google advises against keyword stuffing on landing pages and instead encourages advertisers to create delightful user experiences with good design. A quick Google search online yields numerous results on even more specific ways to improve your Quality Score. This is true of any advertising campaign. You need to know what works and what doesn’t so that you can quickly cut your losses on campaigns with low ROI. Monitoring your accounts closely will give you the data you need to confidently nix one ad and pump more money into another. PPC advertising doesn’t have to be expensive, but it can get pricey if you don’t use it strategically. Outline your advertising goals and start the process with a firm understanding of what your maximum budget is. When you’re operating on a limited budget, your goal should be conversions. This means you should put extra care into crafting your ads, geographically limit your reach, place your ads in the Search Network, and promote your star products.